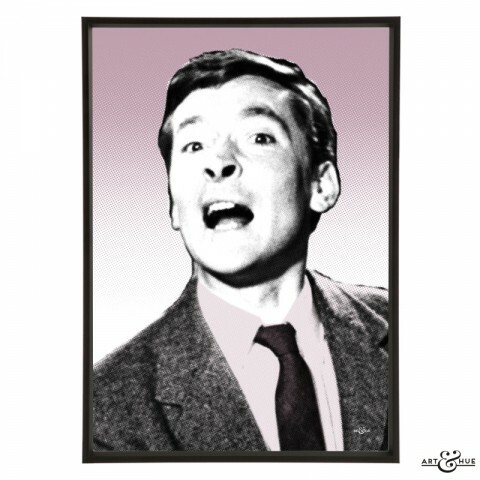 2018 marks 60 years of Carry On Films. 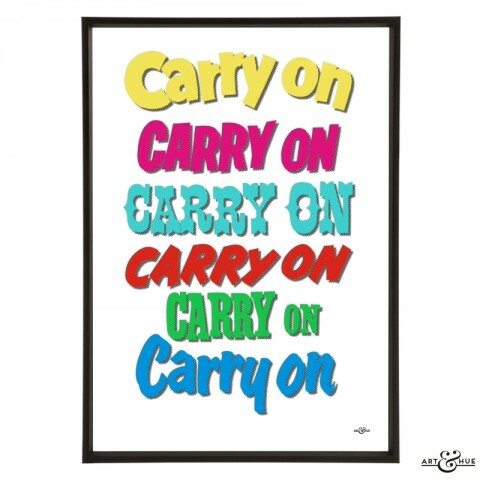 This year is a special anniversary for fans of classic film & British comedy as it’s 60 years since the first classic Carry On production, “Carry On Sergeant”, was released in 1958. 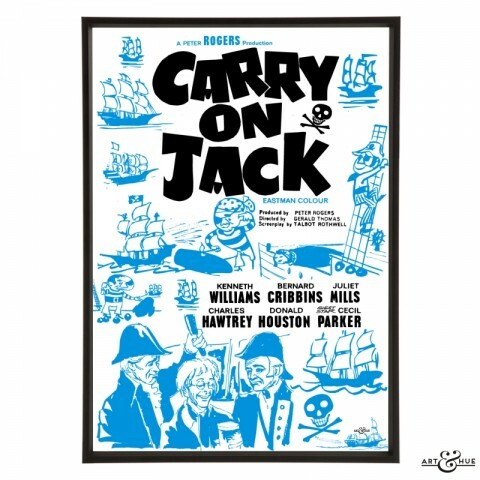 The Carry On films have their own distinct style that is totally unique, beloved by many, and an important part of Britain’s comedy, film, and cultural heritage, and 2018 marks 60 years since the first Carry On film. 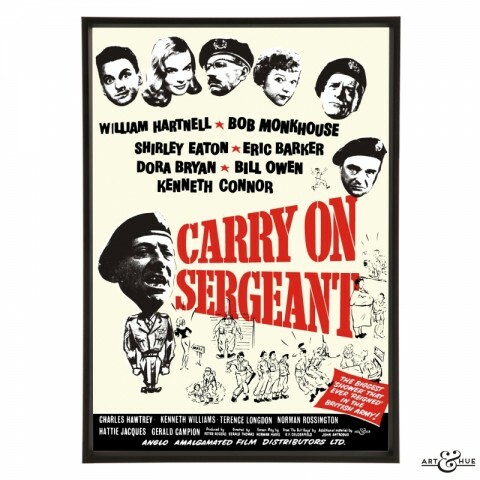 Carry On Sergeant laid the groundwork for the most prolific British film series (yes, longer than James Bond). 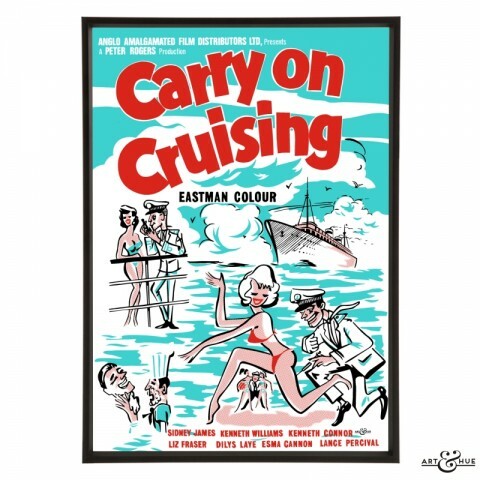 This successful first film was screened to the trade and cinema-bookers on the 1st of August 1958 after which some regional screenings were held from the 31st of August including Aberdeen & Birmingham. 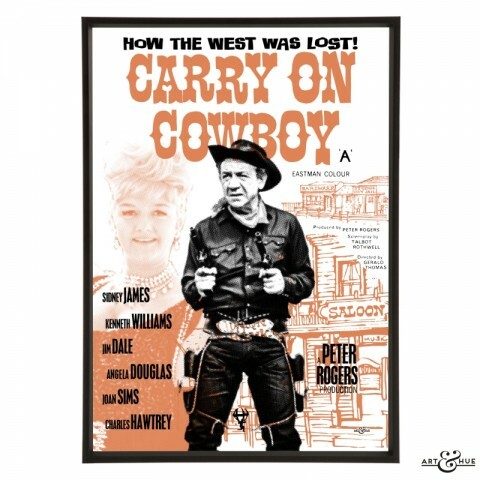 It wasn’t until the 19th of September 1958 that it received its London cinema release at the Plaza, and then the film rolled out nationwide on general release from the 20th of September onwards. 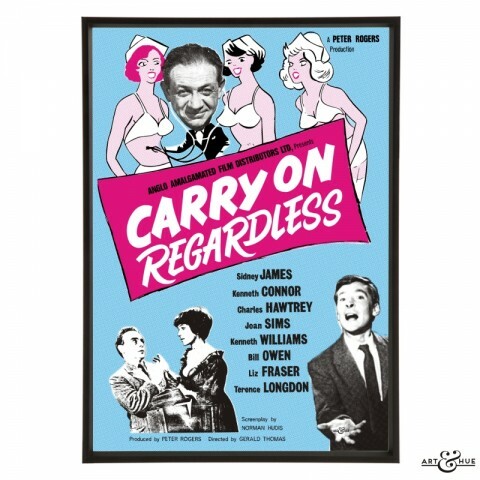 Without the success of the first Carry On, there simply wouldn’t have been all the films that followed in its path. 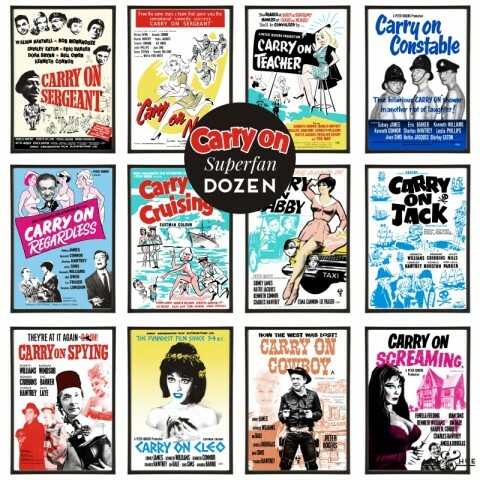 British film company Anglo Amalgamated distributed the first 12 Carry On films starting with Carry On Sergeant in 1958 and ending 50 years ago with Carry On Screaming in 1966. 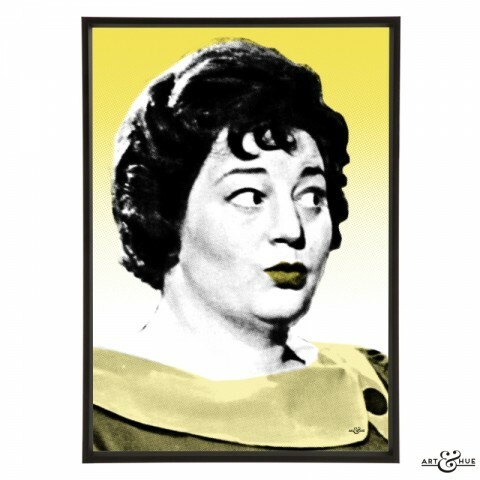 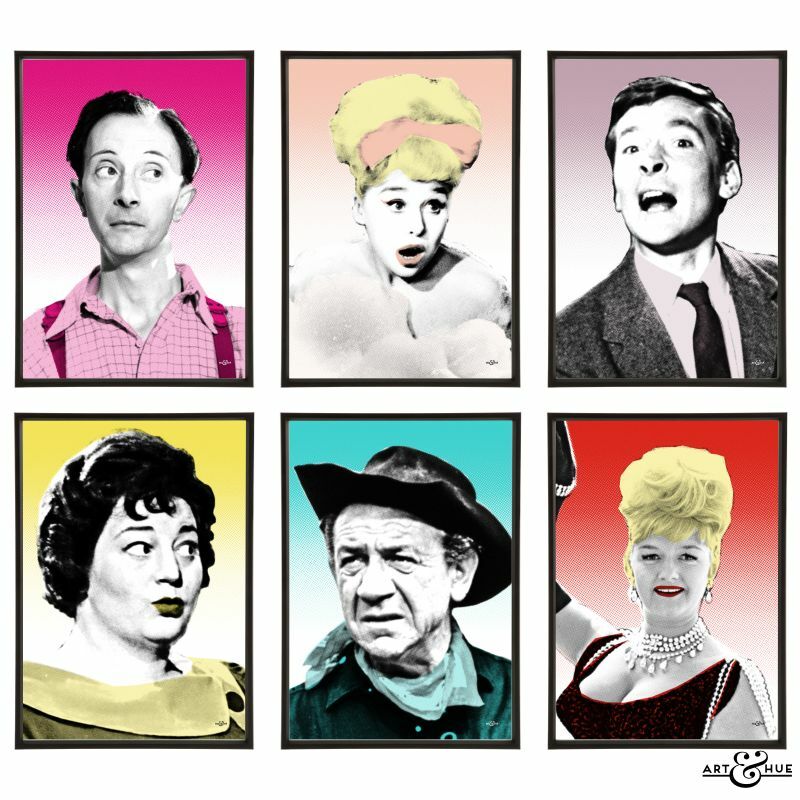 Sid James, Kenneth Williams, Hattie Jacques, Charles Hawtrey, Joan Sims, and Barbara Windsor (Dame Babs) have been given the Art & Hue treatment featuring Art & Hue’s signature halftone style (halftone is an age-old technique that uses dots to make up the printed image, similar to newspapers or comic books). 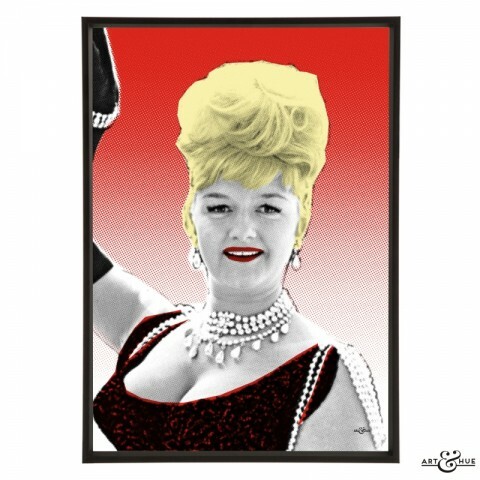 to create a collection of pop art portraits, available in three sizes & 16 colours to choose from to fit into any design scheme. 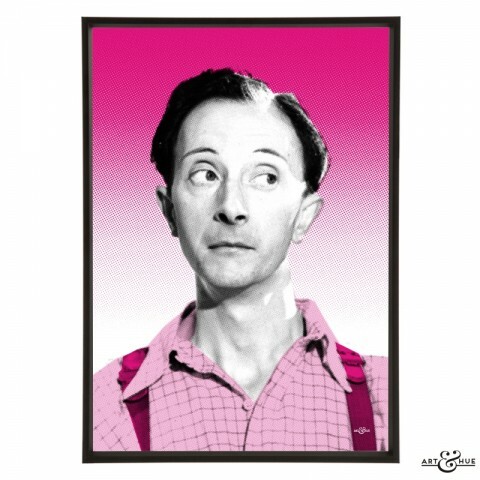 Filmed over eight years at Pinewood Studios, Anglo Amalgamated distributed the first 12 of the classic comedies which made household names of the cast and created enduring films that are distinctly British. 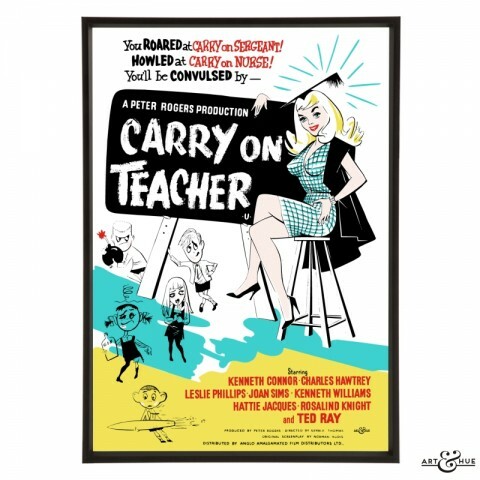 There’s nothing better than discovering a Carry on film on a wet Saturday afternoon and appreciating the saucy yet, by today’s standards, innocent and charming humour. 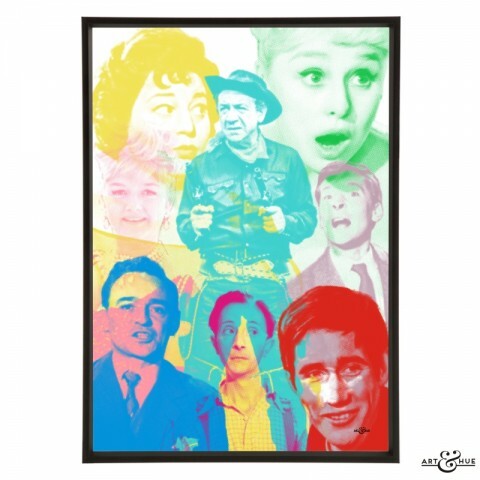 The films have maintained their cultural prominence thanks to regular airings on TV, providing a rite of passage for British children discovering the films for the first time. 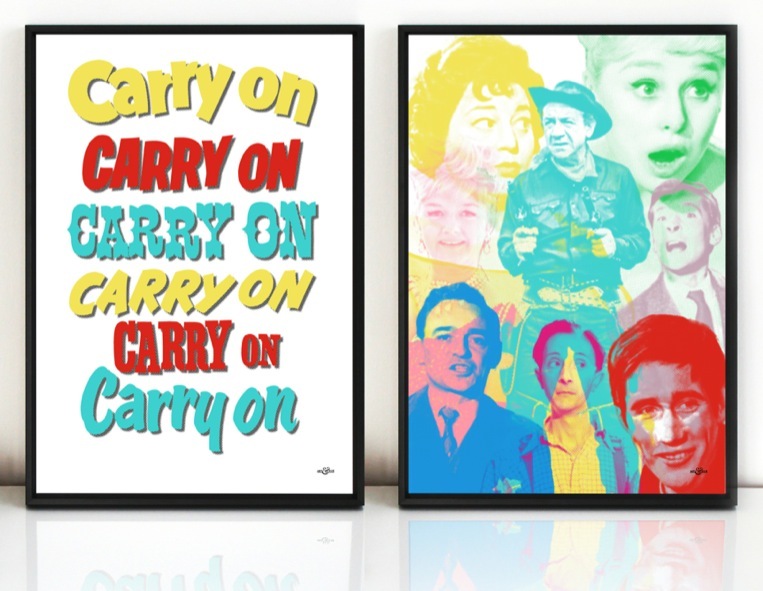 Carry On films are a comedic education that all of us go through, learning to laugh at the slapstick as children, and appreciate the cheeky innuendo when we get older. 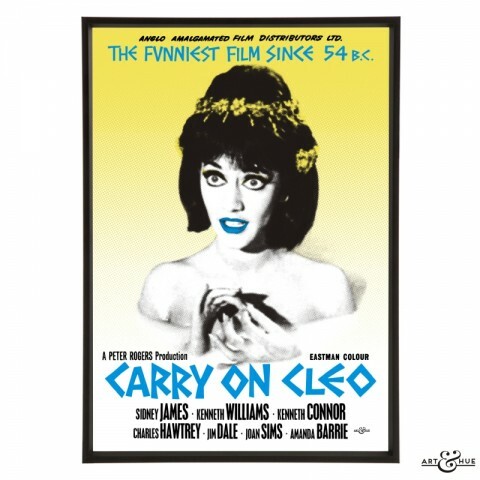 Repeated viewings at various stages of our lives reveal more humour we may have missed when watching the films originally. 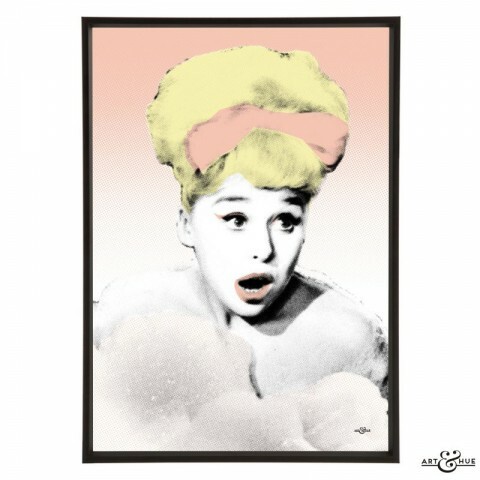 The Anglo Amalgamated era represents a gentler innocence, and a burgeoning confidence reflective of the cultural strides Britain was making during the Swinging 60s. 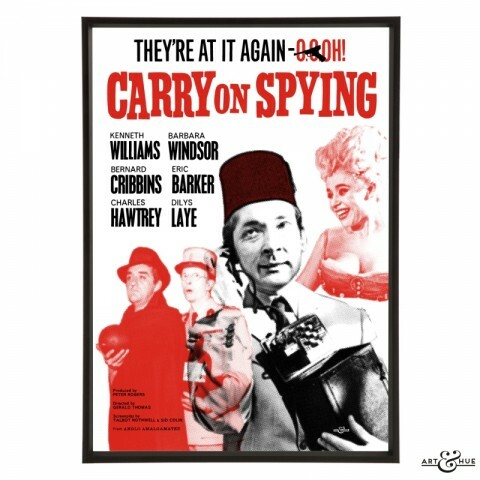 Carry On is the longest-running British film series with 30 original productions, including the Rank releases, plus a compilation film – even superspy James Bond (who the Carry On team parodied in Carry On Spying) will need to produce another five films to catch-up. 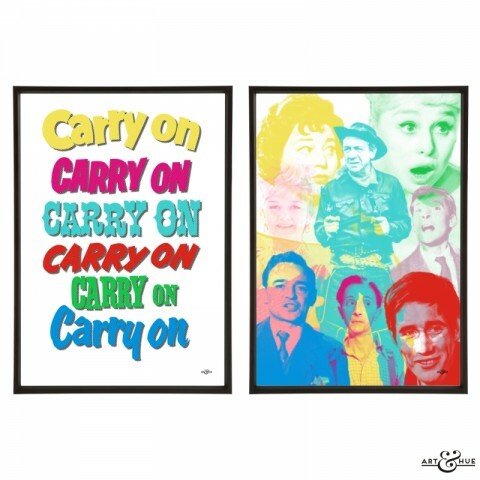 Following on from a long British comedy tradition that dates back to bawdy music halls and end-of-the-pier saucy postcards, it’s the brazen cheek of the Carry Ons that makes them so irresistible and their cultural significance should not be underestimated. 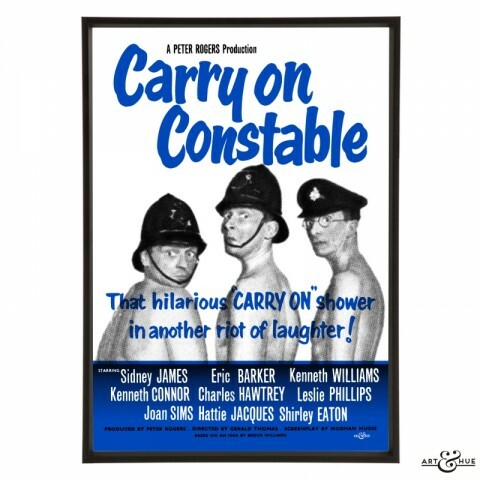 Whilst the humour of the Carry Ons may be derided by some as corny or dated, it’s only because the films have endured and established themselves in the British psyche that the jokes now seem so familiar. 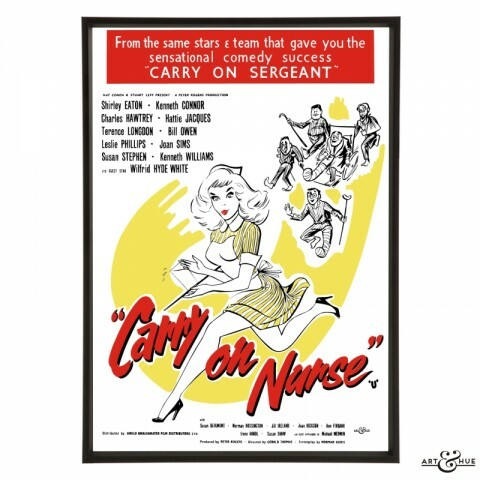 Anglo Amalgamated distributed these British films which were made at Pinewood using British actors specifically for a British audience – it’s hard to point at a fully British production nowadays, let alone one that doesn’t have an eye on international markets or the involvement of Hollywood (although Charles Hawtrey was reportedly crowbarred into Carry On Screaming at the last minute at the behest of the American distributors). 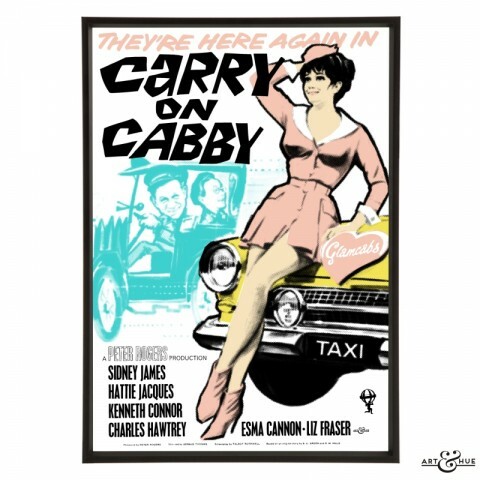 It’s unlikely the Carry On films will be perpetually inspiring fashion designers, in the same way that other 1960s icons have, but who can resist the joys of Joan Sims as a nurse, the high camp of Fenella Fielding as a Hammer House of Horror vamp, or Amanda Barrie as a Glamcabs taxi driver? 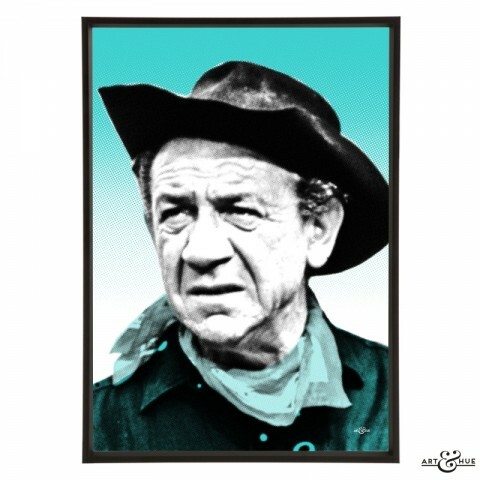 Art & Hue had the pleasure of delving into the archives of Studiocanal at Pinewood Studios to uncover the original posters and photographs of the Carry On series, which have been given the stylish pop art treatment featuring Art & Hue’s signature halftone style (halftone is an age-old technique that uses dots to make up the printed image, similar to newspapers or comic books).